Proposals for a Universal Basic Income or Citizen Income and variants thereof enjoy sympathy from different camps: from conservatives like Richard Nixon 1 , from libertarians who consider themselves disciples of the free market 2 , from liberals like Martin Wolf 3 , from social democrats like Paul Krugman 4 and from people who consider themselves Marxists 5 . However, what each of these proponents actually mean and want with a Universal Basic Income is wildly divergent. Centrally, the Marxists want an end to the “compulsion to work”, liberals and libertarians rather want to provide “incentives to work”. In the following, we first critique these shared wrong premises about productivity, the welfare state and the budget. Then we draw out the contradiction of some left-wing supporters who, on the one hand, insist on unity with libertarian, liberal and social democratic Universal Basic Income proposals in order to acquire a whiff of seriousness and, on the other hand, continuously deny this unity. The point of departure of most, if not all, agitation for a Universal Basic Income is that productivity gains produce poverty. 6 Since this production of poverty is taken as much a self-evident fact as the continued rise in productivity in the future, new policies are needed, so goes the argument, to deal with these effects of technical progress. It is this starting point, though — productivity gains producing poverty —, which should give pause. Taking a step back, gains in productivity mean that more stuff can be produced in the same time. If two chairs can be produced in the same time as it took to produce one chair before, the productivity of making chairs increased. 7 More generally, increasing the productivity of labour means that it takes less effort to produce the same material wealth aka. stuff. This means, we either have to work less to produce the same amount or we can produce more of the stuff we want to consume. A society which produces more productively has more : measured either in material wealth to consume or in free time. Hence, it is not self-evident that increases in productivity produce poverty. Yet, in this society they do. In this society, it is capitalist companies who are increasing productivity and it is no secret that these companies produce to make a profit. The profit is whatever they make on the market in excess of what they paid for means of production (machines, buildings, raw materials, tools) and workers. They try to maximise profit. If a company manages to produce cheaper than its competitors then it can sell its commodities for the same price with lower expenses which translates to increased profits. To produce at a lower cost they could, for example, buy their raw materials more cheaply, e.g. by exploiting price fluctuations. Or, they might manage to get more work out of their workers for the same wage. Or they may increase productivity, i.e. they change the way their products are produced such that their cost price per unit drops. To see how, let us consider an example. Assume a widget company normally has £50,000 invested in raw materials, tools, buildings and machines and £10,000 in wages for 10 workers. Also, let’s say it produces 5,000 widgets with these means of production and workers, so that each widget costs the company £12 to make. Furthermore, say each widget sells at £15, i.e. each widget realises a profit of £3. The overall price fetched on the market for all widgets is £75,000. The profit is £15,000 (after subtracting the advance of £60,000 from the overall price fetched). Now assume, our company is the first to find a new, more productive way of producing widgets. Less work is needed to produce a widget. Assume, so much less that our company can now produce 6,000 widgets with 7 workers in the same time, costing them only £7,000 in wages. On the other hand, increases in productivity have a tendency to require increased outlay in means of production. For example, more productive machines tend to (initially) cost more than their predecessors. Say, our company now has to invest £53,000 in machines, raw materials and so on. Each widget costs the company now £10 instead of £12. Our company could now either continue to sell its widgets for £15 a unit, which would mean a profit of (£15 ⋅ 6, 000 − £53, 000 − £7, 000)=£30, 000 . Or, our company could decide to lower the price of its widgets to make sure it sells all 6,000 of them, say to £13. Then it would make £18,000 in profit, which is still more than before. On the other hand, in the latter case, assume the new machine would cost so much to push the overall investment in means of production up to £56,000. Then our company would not make more profit than before — (£13 ⋅ 6, 000 − £56, 000 − £7, 000)=£15, 000 — and hence would have no reason to change how it produces widgets. A first thing to note is that companies employ labour saving technologies, i.e. increase productivity, to increase their profit. The standard by which such technologies are judged is not whether they save labour, but whether they save on costs per unit. Companies will not always opt for the most productive technology. They opt, if they can, for the cheapest per unit technology. The question for a company is not if a technology is more productive than another, but whether it allows producing more cheaply than another. If a sweatshop achieves lower costs than a modern factory, then sweatshops are the adequate technological level of production for that capitalist branch of industry. However, regardless of why companies increase productivity, such increases still mean that less work is needed to produce the same material wealth. Going back to our initial point, one might be forgiven for thinking that if all the required work is done, we would all get to relax and enjoy life. But as observed by Universal Basic Income supporters, this is not the case. That people are out of work does not mean that all useful things are readily available to them, that there simply is nothing left to do, that everybody is provided for and that people get to enjoy their free time. Instead, those out of work are condemned to idle poverty. The premise of this kind of poverty is that it became easier to produce material wealth. Hence, a lack of it cannot account for this poverty. Indeed, in a capitalist society there is a juxtaposition of wealth and poverty. If you can pay for it, you can fly to space, if you cannot pay for it, you struggle with basic needs. But not even those who still have a job reap the benefits of technological developments. Rather, the norm is that those who remain employed are confronted with demands to work longer and more intensely with their wage under threat. Technological development under the rule of profit produces a juxtaposition of unemployment for some and long hours for others. This is firstly because increasing productivity is only one technique to maximise profit in the permanent competition of companies for it. Lowering wages or pressing more work out of workers for the same wages are also tools applied for that purpose. Secondly, because the poverty of unemployed people — made redundant by new technology — forces them to compete for jobs with those still in employment, labour saving technologies increase competition amongst workers for the remaining jobs, allowing companies to lower wages. Thirdly, those employed have to work harder because labour saving technologies under the rule of profit produce a motivation on the part of the company to get more work out of the remaining workers. More productive technologies offer a relative advantage as long as they are not in general use. A company which produces more cheaply than the competition can sell its products for its target price because its competitors cannot undercut it. But if the competition is catching up, this advantage is gone. Other companies produce more cheaply and can lower the price to (re-)capture market share or to even get in on that extra bit of profit by still being ahead of the slower rest of the competition. Our more productive company’s profits fall again. Maybe another company finds an even cheaper way of producing, pushing our company out of the market. This creates reasons to make those workers remaining work longer: produce and sell as many commodities before the competition catches up. Fourthly, all those companies which did not yet introduce new machinery to increase productivity notice that their competitors undercut them with lower prices. They, too, must sell for a lower price to stay in the market. This lowers their profit which they can try to recover by suppressing the wages of their workers, thus saving costs. They are helped in their endeavour by the fact that their competitors just made many workers unemployed, as explained above, who are now looking for employment. On that matter, Universal Basic Income reformers hold that now technology produces a problem: the wage fails as a mechanism to distribute society’s pie. 13 They think the purpose of the wage is that workers can participate adequately in the wealth of society which they produce under the command of capital. They think of the wage as a sort of reward for contributing to the production of social wealth and notice that it does not currently live up to this ideal. 14 To them technological developments put the wage as a model of distribution into disarray which prompts them to seek alternative ways of distributing social wealth. But, as argued above, the wage is not a reward or remuneration but the lever to make workers come to work for the purpose of profit of a company. 15 This lever is as high and low as companies can get away with in the universal competition of workers for jobs. 16 Put differently, a small part of the wealth produced by workers is paid to workers in the form of wages. This way, they can sustain themselves as producers of a surplus from which they are excluded. In their agitation, proponents for a Universal Basic Income turn the wage into its opposite: the economic function of the wage seems not to be poverty and exclusion from social wealth, but is posited as wealth and participation. Demands for a Universal Basic Income are addressed to the state: the state is asked to react to an undesired economic development. This is apt, as the proponents of a Universal Basic Income relate to socially produced poverty the same way a capitalist state presents its relation to the economy. In its laws the democratic, capitalist state reacts to the capitalist economy, which it treats as an a priori fact. A democratic, capitalist state regards the economic roles of its subjects as something given. It does not decree who engages in which production process or assigns roles in the capitalist economy. Instead, its law merely defines that citizens have particular rights and duties if they happen to be in the situation of being workers, bosses, landlords, tenants, lawyers, bankers and so on. To the state these figures are given and they do their thing anyway. The proponents of a Universal Basic Income accept this relationship between capitalist state and capital as given and ask the capitalist state to react to a new economic development whose reasons are of no concern to them. However, technological development for profit and the separation of workers from the wealth of society is not prior to the capitalist state but is premised on it. But the guarantee of private property does not suffice for a modern capitalist economy. It asks for a lot more. For example, technological developments do not come about spontaneously but rely on a little bit of help from the capitalist state. Secondly, it is a long way from a scientific discovery to its successful exploitation in the interest of profit. When a technology is not profitable (yet) but deemed beneficial to the national economy, the capitalist state helps it along its way by either organising its roll-out itself (train track networks, roads, telephone networks) or by subsidising the relevant industries (solar energy, nuclear power). Without these interventions technological development under the rule of capital would have taken a lot slower pace. Demands for a Universal Basic Income react to effects of technological developments, developments that were helped on their way by the capitalist state. The capitalist state, to which the supporters of a Universal Basic Income turn, does not encounter the capitalist mode of production, it maintains and furthers it. Capital in its drive for profit permanently makes workers redundant. It finds new ways of producing without some of its workers. Yet, it also sometimes needs more workers, for example, when new labour intensive branches of industry develop. Also, the economy goes through boom and bust, or some branch of industry prospers while another falters. Capital wants to find workers readily available whenever it needs them and to throw them out whenever it does not. Only if unemployed people are not left to starve, they are still available if or whenever their services are requested. What might present itself as reacting to and dealing with the effects of the capitalist economy is in fact a contribution to its maintenance. This creates a bit of a pickle: the capitalist mode of production depends on the compulsion to work. Workers produce the products companies turn into profits. If workers are simply and comfortably provided for without them needing to work for some company, they would have no objective reason to show up to work. On the other hand, when unemployed workers are not provided for, they are not available to capital when needed. They must be maintained but this undermines their need to work for a capitalist company. The result of these opposing interests — maintenance when out of work, but without making workers free from the compulsion to work — is a social security system which maintains poverty below even normal working class poverty levels. In addition, the permanent compulsion by the job centre to be looking for work is meant to make life on the dole so miserable as to not present a real alternative to wage labour, i.e. to producing profits for capitalist companies. The poverty and stress under the thumb of the job centre is a consequence of the purpose of social security — maintaining a useful working class. This does not mean there is no range of possibilities of how life on the dole might look like, but hopes of the social state ending poverty mistake it for something which it is not. It maintains it as a service to capital so that it can find the workers it needs even after it has discarded them. Proposals for a Universal Basic Income do not ask what the capitalist state actually does and why. They do not ask what purposes are realised by maintaining the poverty of the working class in this way. These proposals instead posit their own image of how they would prefer the world to be and suggest policies which ought to get us there. 22 When left-wing supporters of a Universal Basic Income see Universal Credit in the Uk or social security changes in Cyprus as a first step towards realising their aims — except, of course, “details” like conditionality, compulsion to work and the amount of money actually paid out — they are ignorant as to why the capitalist state attaches conditionality and compulsion to work to its benefits, and why these benefits are so low. A fair amount of writing about a Universal Basic Income is spent on answering the anticipated question “can we afford it”. The answer by supporters of a Universal Basic Income is a resounding “yes” backed by alternative budget plans. This way, demands for a Universal Basic Income present themselves as realistic. 23 So realistic that they find nothing strange about an economy where providing people with what they need is a burden to the economy instead of its aim. The proponents are aware of the state’s worries about the budget and would not propose a reform without suggesting how to finance it: firstly through changes to taxation and secondly through reallocations of parts of the state’s budget. Under the name “Universal Basic Income” contradictory purposes are pursued. The mutually contradictory purposes find expression in different answers to the question of how much it ought to be. This quantitative question expresses qualitatively rather different purposes. 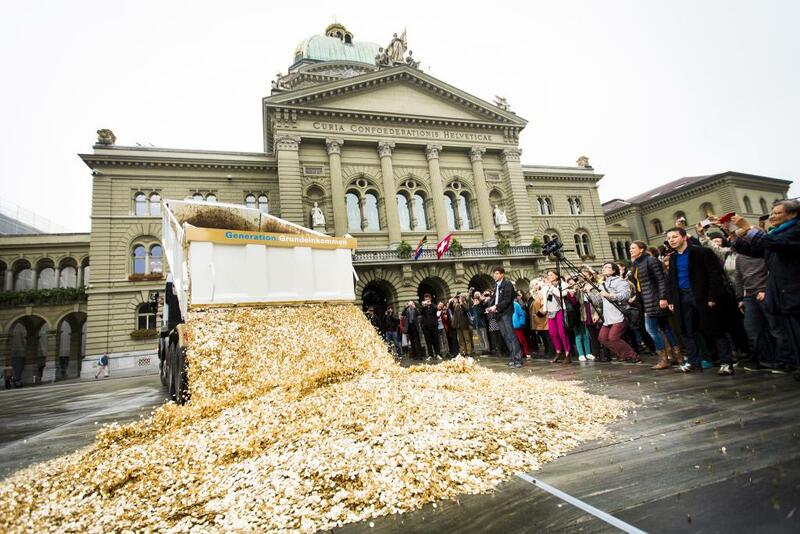 For post-autonomist Marxist supporters a Universal Basic Income promises freedom from work. 28 For them a Universal Basic Income ought to be enough to not have to worry about material needs. Not just enough money to get by, but enough money to deal with everything life throws at you: the washing machine breaks, moving to a different place, raising children, an accident, taking care of someone, needing a new car, Apple releasing a new Macbook with a quantum processor eventually obsoleting your kit, etc. 29 In this left-wing vision of a Universal Basic Income it would be sufficient to never have to work for a capitalist employer again. They want people to be able to opt out of work for a company. Given these radically different purposes, there is no actual unity amongst the proponents of a Universal Basic Income. It hence makes no sense to be in favour of “ the Universal Basis Income”. What is called “Universal Basic Income” means radically different things depending on who proposes it and why. Yet, it is important especially for left-wing supporters of a Universal Basic Income to posit unity. If only a few post-autonomist Marxists demanded a Universal Basic Income the demand would be as “realistic” as a call for a revolution. If, on the other hand, they can point to bourgeois economists like Krugman or Wolf, to a conservative Us president like Nixon even, their project gets a veneer of seriousness and realism. By referring to the ink being spilled on a Universal Basic Income in the Economist and the Ft these radical critics of society can point out how practical their suggestions are. In the name of realism these radical supporters of a Universal Basic Income want to end capitalism while presupposing its continued existence. If people are free from any compulsion to work for a capitalist company, this would destroy the capitalist mode of production. This, after all, relies on the workers to produce the products which are turned into profits. It also relies on the exclusion of workers from these products so that they can become profits. However, at the same time, the same supporters also ask the same capitalist firms to produce the profits to pay for freedom from them in the form of a Universal Basic Income. They want both: the continued existence — for now — of the capitalist mode of production where the reproduction of each and everyone is subjugated to profit and the end of this subjugation by providing everyone with what they need. They want companies to make profits, which relies on and produces the poverty of workers, while at the same time ending mass poverty. They want to maintain the exclusion from social wealth through the institution of private property and end this exclusion by giving everyone enough money. Whilst realism tells these supporters to make the provision of poor people conditional on the success of capitalist firms, it does not make them shy away from these paradoxes. By insisting on unity with their opponents these anti-capitalist supporters aim to demonstrate that they are not ivory-tower, dreamy intellectuals but serious, realistic proponents of policy. However, now they are confronted with a problem: what Krugman, Wolf and Nixon want is not at all what they want. Mainstream supporters of a Universal Basic Income want to maintain the poverty that capitalism produces, the radical left wishes to end it. Hence, in a second step, the posited unity must be denied. 30 Radical writers distance themselves from their mainstream counterparts and urge each other to caution. They insist that their successful opponents want what they want so their project is not just blue sky dreaming, but their successful opponents also do not want what they want, so they have to be careful. They want the same as Richard Nixon, Martin Wolf and Paul Krugman which is why their proposals are serious and they do not want what Nixon, Wolf and Krugman want which is why their proposals are radical. The radical supporters of a Universal Basic Income notice this contradiction. For them, it is the start of a debate on how to “strategically” deal with this situation; how to keep a radical profile while campaigning for this reform. However, by the time they “problematise” that their realistic policy suggestion also finds support from their opponents (but whose support makes it realistic in the first place) it is too late. They have already accepted that this society can be for those subjected to it, when they encounter that it is in fact not: when it gets easier to produce stuff, more poverty is the result. The problem with a demand for a Universal Basic Income is not that it is not going far enough or that it is not radical enough . 31 This criticism presupposes a unity of purpose and accuses this reformist demand of being limited in its seriousness of pursuing it. But if people put forward demand A — a Universal Basis Income — instead of demand B — the end of the capitalist mode of production, say — they have their reasons. To hit its mark a critique must take seriously that the proponents of a Universal Basic Income take the capitalist relation of technology and poverty as a self-evident starting point, that they claim the wage is a reward, that they consider the capitalist state as a neutral arbitrator encountering the capitalist economy as an a priori fact, that they share the state’s worry about its economy and its budget, and that they believe the welfare state to be a means to end poverty. These wide-spread but incorrect judgements lie behind the appeal of demands for a Universal Basic Income and that is why everything is wrong with free money. A common criticism levelled against proposals for a Universal Basic Income is that giving poor people money to cover their needs would necessarily lead to inflation. Since all that money in the hands of poor people would produce an increase in effective demand, landlords and supermarkets could ramp up prices in response, leading to overall inflation. Indeed, in a first step the arrival of lots of money in the hands of poor people would likely increase demand for the goods affordable on a Universal Basic Income. In response, merchants, producers of mass consumption commodities and landlords could increase prices. As a result, their profits would rise. This makes these branches of industry more appealing to other capitalists. Producing, say, milk would promise higher profits for the same investment than, say, producing sports cars. 32 Hence, other capitalists would switch industries from, say, luxury production, to producing commodities within reach for those on a Universal Basic Income. As a consequence, supply of those commodities would increase, suppressing prices again. Whether this, in turn, would reduce supply in other branches of industry leading to rising prices there, depends on how a Universal Basic Income would be financed. Assume the funds for paying for a Universal Basic Income came from taxation as proposed by most proponents: the capitalist state takes money away from some citizens and gives part of it to others. In this case, whatever additional effective demand will come from poor people, it was expropriated from others who will now lack it. While effective demand for, say, milk increases, it decreases for, say, sports cars or big machines. In this case, all these proposals of a Universal Basic Income attempt to do is to redistribute wealth. This produces hiccups in the reproduction of the capitalist economy but does not necessarily lead to inflation. It is a different situation, though, if the money for a Universal Basic Income were raised through sovereign debt. If the state takes on debt for such a capitalistically unproductive venture as providing for its population then inflation is not unlikely. This is, however, a question of sovereign debt, its money-like qualities and the unproductive nature of state spending; not a question of a Universal Basic Income. “Until recently, the conventional wisdom about the effects of technology on workers was, in a way, comforting. Clearly, many workers weren’t sharing fully — or, in many cases, at all — in the benefits of rising productivity; instead, the bulk of the gains were going to a minority of the work force. But this, the story went, was because modern technology was raising the demand for highly educated workers while reducing the demand for less educated workers. And the solution was more education. […] Today, however, a much darker picture of the effects of technology on labor is emerging. In this picture, highly educated workers are as likely as less educated workers to find themselves displaced and devalued, and pushing for more education may create as many problems as it solves.” — Paul Krugman. op. cit. “The argument that a rise in potential productivity would make us permanently worse off is ingenious. More plausible, to me at least, are other possibilities: there could be a large adjustment shock as workers are laid off; the market wages of unskilled people might fall far below a socially acceptable minimum; and, combined with other new technologies, robots might make the distribution of income far more unequal than it is already.” — Martin Wolf. op. cit. Kathi Weeks is a radical critic of the wage system and she even criticises the “Wages for Housework” campaign for aiming to expand it to housework. However, she shares the idea that the wage is a mechanism for social distribution which rewards contributions with those she criticises. Her criticism is that these rewards are arbitrary, agreeing with the false notion that the wage is a reward. If prices determine supply and demand and supply and demand determine prices we arrived at a circular explanation of price, i.e. not an explanation. Indeed, to explain what determines prices a first question would be what a price actually expresses. What is this quality of a commodity that is expressed in the price of it. What does it mean to say a commodity is “worth” this or that much. This question is the starting point of Karl Marx’s Capital which we would recommend to anyone. Hope you don't mind me posting here, I noticed that none of your stuff is on here and i read Kittens 5 and enjoyed these 2 essays in particular. We don't mind at all. On the contrary, thanks for posting it!